The other day, I was playing around with providing users the ability to easily copy data. This was needed in order to transfer that data to another application. Since this was for an AngularJS application, a reusable directive seemed like a good idea. 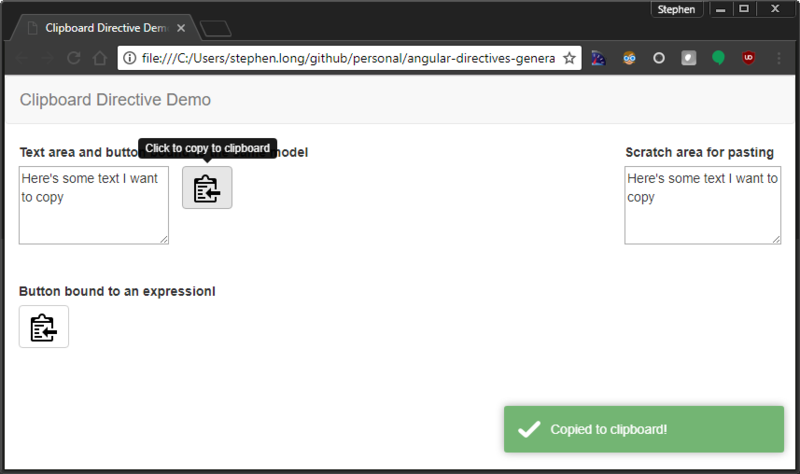 While Anuglar 4.x is all the rage, I continue to also work in Angular 1.x (AngularJS) projects. Earlier this week, a colleague of mine wanted to use an input mask that doesn’t affect an underlying ng-model value. We already had a directive using jquery.input-mask, but that modifies the model value. Formatters and parsers are suited well for this task of separating the view value and model value. I was playing around with my trusty multi-select dropdown earlier today and a colleague of mine pointed out that changing the selected items outside of the directive would not actually deselect previously selected items. This was a curious bug since I knew I had a watcher on the ngModel selections. Writing web-based line of business applications entails creating a lot of views with tables. There are many jQuery table plugins and Angular directives for rendering tables, but I created my own for, primarily, read only tables. In most of the UI’s I work on lately, it’s necessary to provide start and end date selection. The typical use case is for setting date ranges for searching and storage of effective dates. Being that these are typically Angular applications, tying into Angular’s form validation makes a lot of sense.